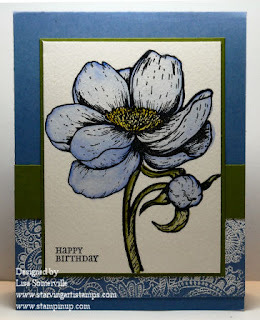 Have you been to the Stamp Something Blog lately? The Challenge for today is Birthdays - and Starving Artistamps is the sponsor! Create a birthday card and then head over to the Stamp Something Blog and leave a comment with a link to your creation for a chance to win the DoodleFactory new Valentine Release as seen in my post here. Hurry you have until Jan 22nd, to create your card and leave your link on the Stamp Something Blog. Don't have to time to enter - no worries you can save 10% on all Starving Artistamps and DoodleFactory stamps when you shop Starving Artstamps and use code savetenls. For my card I used the Bees Sheet , coloring using the Marker Water Coloring Technique. The Happy Birthday is from Stampin' Up! 's Mark the Date set. To create the look of a piece of Designer Paper, I stamped and white embossed the Ornate Tooled Leather.